'"Fashion/Style/Beauty."' Blog about fashion and what new trends are in for fashion. For style, blog about different ways you can wear that new scarf you just bought. For the topic on makeup, talk about what new trends are in, and/or different ways to style your eyeliner. Reviews. Reviews of movies, games, products, and anything! It doesn't matter how old it is or what it is, just give your general opinion on whatever your reviewing, and at the end, give it a rating. If you keep it fresh by adding clips or photos and pulling from sources that nobody else is using, you could have a hit blog on your hands. Love. Everybody needs some love! Maybe you can give advice about how to get a date! If you're a little more inappropriate maybe be a little sexual to get more men or women followers. Know what not to blog about too. Your workplace, your coworkers, your family members, etc. may take a dim view of anything on your blog if it blows open secrets, shares confidential information, makes fun of people you work or live with, or causes other people trouble. Know the limits––check with your workplace what is and is not permissible by way of personal blogging and ask your friends and family before including them in your posts. Spy on your competition. Take a look at other blogs on your topic to see what other people are already doing. Ask yourself what you have to offer that is different from what other people are already doing. Identifying your niche will give your blog an angle that distinguishes it from your competitors. Generate some names for your blog. Try brainstorming a list of names and writing them on a piece of paper, or talk to friends and family to get ideas. You can also try freewriting to see what comes out of your mind as you free associate about your topic. Enter items that are relevant to your topic into the appropriate search field. You can search by word or phrase, by website or by subject. The tool will generate words or phrases associated with your topic. Pick the words that have a high number of monthly searches but have low to medium levels of competition. Try to include them in your blog name. Check these keywords from time to time when you're writing a blog post. If you fit the keywords into your posts in a natural way, then search engines may be more likely to pick up on your blog and show it to people who are conducting searches about your subject. Decide where to create and host your blog. Blogger and WordPress are 2 of the most popular blog creation sites on the Web. Blogger: Google owns Blogger and has set it up for ease of use. Your blog will be extremely easy to set up and maintain, and you'll have Google's traffic management tools at your disposal. You can purchase a custom domain name for US$10 per year or you can get a free BlogSpot domain name such as yourblog.blogspot.com. If you already own another domain name, you can use it for no cost. Tumblr.com. This is a very handy, world-wide micro-blogging site. It provides a very friendly user interface and even helps place ads on your blog page to get you money. 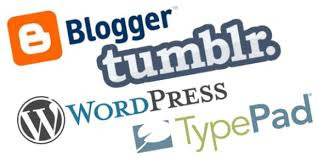 For more information read this article on how to create a Tumblr accountblog. Webs.com: Webs is a website builder that has been around since 2001. Everything about this website builder is customizable with their drop-n-drag feature. What's even better about this builder, is that you do not need any technical skills. Everything you need to know about what you want included in your blog is in front of you with easy to see/read options. Personal sites start free with no trial period. Of course, if you want some enhanced features, you will need to upgrade for an affordable fee. Point your browser to WordPress at https://wordpress.com/. Click on the "Get Started" link. Fill out the online form. In the last field, type the proposed web address for your blog. The web hosting will do a quick lookup to see if the name appears on their system already. If your desired name is taken, WordPress.org will display a series of available alternatives. You can choose 1 of those options or try a different domain name until you find something that works. Scroll to the bottom of the page and click "Create Blog." Wait for your confirmation email. When it arrives, click the link and then sign into WordPress with your username and password. Choose a Theme for your blog. Your Theme determines the layout and appearance of your blog. You can either search for themes after clicking on the "Find a Theme" button or you can browse Themes based on criteria like what's trending or what's most popular. Click on the Theme you want and fill in the fields on the General Settings screen. If you want to, you can upload a photo of yourself by clicking the "Choose File" button in the gray "Blog Picture/Icon" box. Decide whether you want your blog to be private or public. Do you want any Internet visitor to be able to read your blog, or do you just want your friends and family to be able to read it? Pick the appropriate setting by clicking on the "Reading" link beneath the "Settings" tab. Write your first post. Click the "New Post" tab and enter your title and the body of your blog. You can also add photos, videos or links by using the appropriate buttons. When you're done, click "Publish Post." Most blog hosting sites will automatically publish a link to your newest blog post on Facebook or Twitter. Look for sharing settings or buttons when you publish your post. For instance, WordPress lets you control sharing by going to your Dashboard and clicking "Sharing" under the "Settings" tab. Blogger has social media buttons on the bottom of your post for sharing. Write something about yourself. Add an "About Me" page on WordPress or click "Layout" and then "Edit" under "About Me" on Blogger. Promote your expertise related to your topic as well as including any personal information or background information that you want to share. List your blog to draw traffic. You can add a Blogger site to Blogger's listings. You can also list your blog with directories like Technorati or Blogdex. Interact with other bloggers. If another blogger "Likes" your site, then go to his or her site and either "Like" a post or follow the blog. Also, comment regularly on other people's blogs. People will get to know you from your comments and will come to appreciate your expertise. Produce stellar content. If your blog is full of grammatical errors or looks unattractive, you aren't going to draw regular visitors. You also need to make sure that you publish regularly so that your content is up-to-date and fresh for your readers.